Stem cells derived from adult cells, called human induced pluripotent stem cells (hiPSCs), have great potential for basic research and regeneration therapies. But for clinical samples to be safe, these cells need to completely differentiate into their target cells. Any remaining undifferentiated cells in the sample have the potential to form tumours, so must be selectively eliminated. Researchers at Kyoto University in Japan have developed a compound that selectively kills undifferentiated hiPSCs. This compound could work alongside other cleansing strategies also under development to enable pluripotent stem cell use in patient treatment, such as regrowing tissues and organs. 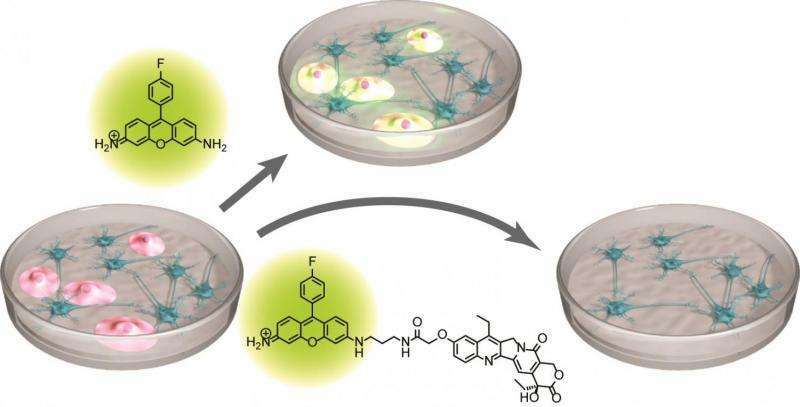 Led by Professor Motonari Uesugi of Kyoto University's Institute for Integrated Cell-Material Sciences (iCeMS), the researchers combined a florescent probe with an anticancer agent into a deadly, glowing combination that selectively targets and kills undifferentiated cells. They call it "conjugate 17." After 72 hours, conjugate 17 completely eliminates undifferentiated cells from samples, while leaving the important differentiated cells unharmed, according to a paper recently published in the journal Angewandte Chemie International Edition. Conjugate 17 takes advantage of the repressed expression of two protein pumps in hiPSCs. ATP-binding cassette (ABC) transporters are a family of protein pumps that help transport substances across cell membranes. The transporters ABCB1 and ABCG2 are repressed in hiPSCs. A fluorescent probe developed also by Professor Uesugi's team, called KP-1, exploits this repression to selectively label hiPSCs. Cells that don't have repressed ABCB1 and ABCG2 transporters remove the probe and are thus not labelled. The researchers modified KP-1 to combine with a variety of cytotoxic anticancer drugs. They found the best results when the probe was paired with the anticancer agent SN38, and conjugate 17 was born. Although SN38 is intrinsically selective for hiPSCs, this selectivity was enhanced when combined with KP-1, making it even more effective. After treating a sample with conjugate 17, it is imperative that the compound does not remain in the sample, otherwise the cells cannot be used for transplantation. The researchers found washing the sample twice adequately removed the compound, because it no longer glowed. Although further studies are needed to ensure the safety of conjugate 17, the researchers note it "promises a new way for developing highly selective, chemically tractable reagents" to ensure samples are clear of any undifferentiated cells.